Mish's Global Economic Trend Analysis: What Do Treasury Yields Say About Job Expectations, Inflation Expectations, and the Recovery? 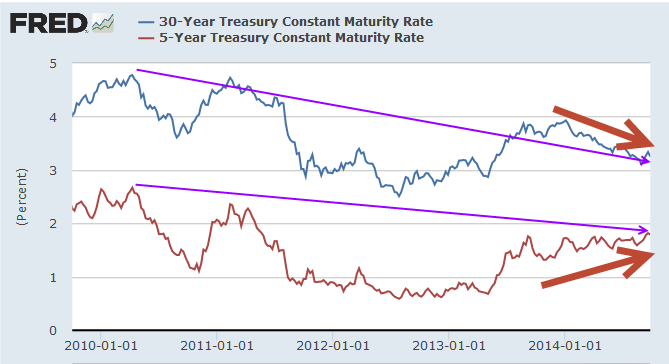 What Do Treasury Yields Say About Job Expectations, Inflation Expectations, and the Recovery? Curve Watcher's Anonymous notes some interesting reactions in the treasury bond market following a string of good job reports. Today the jobs numbers once again beat expectations: Nonfarm Payrolls Rose by 248,000 and the unemployment rate fell to 5.9%. In seven out of the last eight months, jobs rose by over 200,000. Last month was the exception, but even then, the initial job report was revised up 69,000 to +180,000. In light of such purportedly strong data, especially with the Fed tapering ending this month and expectations across the board of fed hikes, yield on the long bond should be rising. 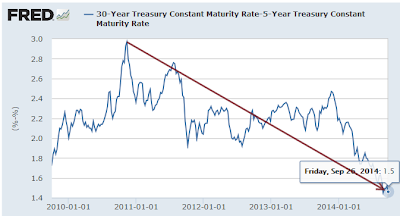 The yield curve also should be steepening, at least if one believes in the recovery. Let's take a look to see what is actually happening. 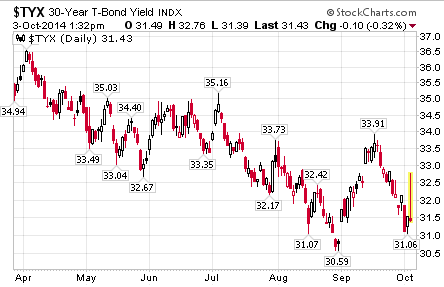 Yield on the 30-year long bond shot up on the job report but is now in the red for the day. This is not what one would expect following a strong jobs report. Nonetheless, one day does not prove much. 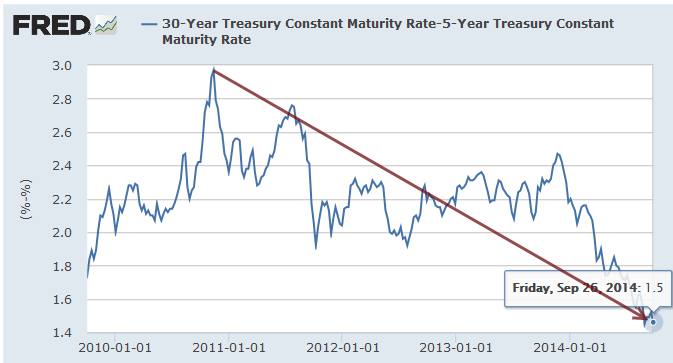 Let's take a look at the 5-year and 30-year treasuries over time. The long-term trend since 2010 has been a gentle flattening of the curves. Moreover, since the beginning of the year the spread between 30-year and 5-year treasuries has decreased significantly as the following chart shows in detail. The above chart shows weekly closes. The last data point is from September 26. At the end of the day, the spread will be a bit lower than shown above. I currently have the spread at 1.396 (3.133 on the 30-year minus 1.737 on the 5-year), down about 10 basis points this week. Instead of the curve steepening as one would expect in a recovery, the 5-30 spread curve has been declining since hitting a peak of 3.0 in November of 2010. 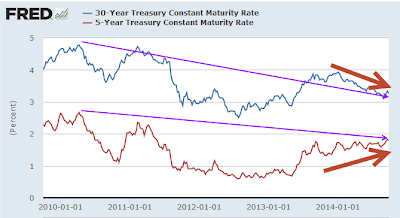 The bond market does not think much of an ongoing recovery or future price inflation prospects, and neither do I. By the way, I occasionally get asked "Who is Curve Watcher's Anonymous?" The answer is me.